Confession: I love board games. I know. Your jaw just dropped and you are speechless. I truly believe I could play games every single day and not get tired of it. With the variety of styles, themes, weight, etc., the board gaming hobby feels truly unique to me compared to other hobbies I’ve quickly grown tired of. Lara will be the first to admit that she’s not as much of a fanatic as I am. She genuinely enjoys the hobby, wants to play most days, and has a really great perspective on what we play. However, she’s not the kind of person who could play games every day. Trust me, I’ve tried to get her to do that, and it didn’t work. I don’t fault her for that. I don’t push the issue. She just would rather do other things sometimes (and actually, that’s probably normal). Sometimes, though, that leaves me with my desire to play something but no one to play it with. Thank heavens for Solo Gaming! My first experiences with solo gaming were mainly just to learn the rules in order to teach the game to new players. Many of those experiences weren’t actually “solo” plays, but running through a few turns as several players just to get the mechanics down. My first true solo experience I can remember was with Elder Sign. I played through an entire game by myself and I really enjoyed it! It occurred to me then that this could actually be a viable way to play when either Lara wasn’t up to playing, or if she just happened to not be home for whatever reason. I continued playing games with single player modes and discovered something, though. Many games that aren’t designed for solo gaming sometimes try to shoehorn a variant in the rulebook. I get it, it’s a marketing tactic. Showing a game has the potential to be played with a wide variety of player counts makes it appeal to a larger audience. Publishers take note though, it leaves a bad taste in my mouth when it feels like a player count variant has been added just to sell more copies. However, I’d like to point out a couple of exceptions to this… As I mentioned above, Elder Sign, as well as any of the Arkham games from Fantasy Flight, works very well solo. You are even given the option to control more than one character. I usually choose just to do one though, as my feeble mind can’t keep up with two for a whole game. Also, Bezier Games has excelled with their single player variants I’ve played. Both Castles of Mad King Ludwig and Colony have excellent single player modes. After playing all of these games with variants, I decided I wanted to dive in and acquire a game created specifically for solo gaming. 1 player only. 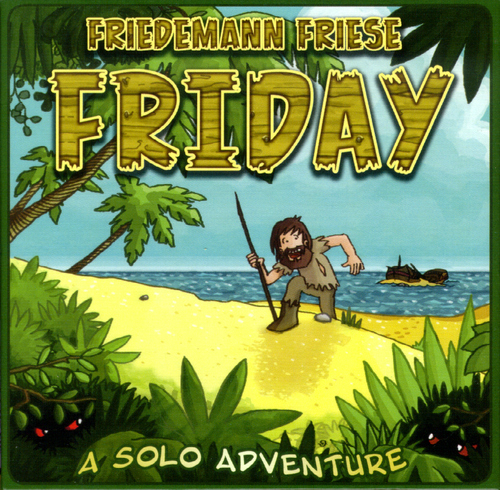 I kept seeing and hearing about this little game called Friday by Friedemann Friese and it’s been on my radar for a while now. I finally caved and initiated a trade on BoardGameGeek – my copy of Chez Geek for another gamer’s copy of Friday. The premise of Friday is simple. You play as Friday and must help Robinson Crusoe survive the island and prepare him to defeat the pirates. It’s essentially a solitaire deck-building game in which you optimize your deck by defeating hazards that in return add to your deck of fight cards. It’s a great take on deck-building I had never played before and I found it very refreshing. I really enjoyed playing Friday. I found it very engaging and it was perfectly tailored to solo gaming. It’s got a small footprint, comes in a small box and is relatively inexpensive. Amazon has it for $13 right now. If you are looking for a solo gaming experience for those times when your spouse isn’t quite feeling it, you should definitely check out Friday! Eventually, I’d like to introduce it to Lara and we can compete to see who can get the best score. Though we all know it will probably be her. While I prefer playing with my best friend and our game group, solo gaming offers a great opportunity to allow me to enjoy my favorite hobby when I just can’t get others to the table. And even though one of the main attractions to the hobby is interacting with other human beings, solo gaming can be a great way to challenge yourself, hone your strategies, and really see what you are made of without others thwarting your plans. Do you have any solo games you enjoy playing? Let me know!! Episode #12 Our top Lovecraftian games! I’ve recently purchased Clank! and have played it with 2 and 3 players, then discovered there’s an app from the publisher Renegade Games that contains a solo variant. Rahdo did a run-through of it and the expansion at the same time and it looked pretty sweet. I’m hopefully going to try it with just the base game soon, and then maybe I’ll report back with my experience! Otherwise another one I’ve heard good things about but have only played the digital version of is Onirim. Same for the Pathfinder Adventure Card Game. Both have good digital adaptions, which I think can make solo gaming a little more accessible. Onirim is a lot of fun, and yes, I am also looking forward to giving the solo Clank! a try. Let me know what you think! Thanks for the comment!. I really like Onirim as well. I’ve solo variants of Scythe (very fun but the Automa movement can get confusing), Imperial Settlers (Not bad, will play more times solo) and Ascension (which I’ve played many times on the solo variant. Easy and fun). Now, every time I look into getting a game, I make sure it has a solo variant, for the same reason in your article, my wife doesn’t always want to play games.